Your conservatory should be a lovely, integral part of your home, a light, airy room that's a pleasure to spend time in. But over time your conservatory can develop draughts, leaks, misted windows, ventilation issue or a creaking frame which can all prevent you from actively using it. Plus it's also common for a conservatory to be too hot during the summer or too cold during the winter. These issues could be because of design, poor initial installation, subsidence or a lack of maintenance but at Homesecure 24hr Ltd, as expert glaziers and UPVC frame specialists we have the experience to recognize and repair these problems, proving a huge saving over installing a brand new conservatory. 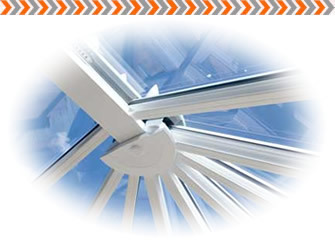 We repair slipped glazing panels, slipped roof panels, cracks in frames, leaking frames, leaking guttering, failed misty sealed units blown seals and all other conservatory defects. We will only resort to replacing a unit when we have to. We also clean and renovate conservatories. Exposure to the elements causes UPVC frames to become dirty and to deteriate but we will professionally valet your conservatory, cleaning fascias, soffits, guttering, bargeboards and doors, producing outstanding results and in the process help to keep window seals from opening and leaking. In the event that a repair cannot be recommended or an upgrade is needed, Homesecure UK can replace units with more energy efficient glass, more substantial frames and fit whole conservatory roofs. And if as the most important element to your conservatory, you need a new roof, changing from a low pitched roof which traps excessive heat at a lower level, to a high pitched roof will do much to alleviate the problem. Whatever your conservatory problems, or if it just requires maintenance and cleaning, there is nothing to lose by asking us for a free quotation. Our promise is use the most economical but professional methods to restore your conservatory and make it an attractive and comfortable part of your home again, all year round.